You are probably reading the headline and wondering what on earth is CMQP. Well you will not have heard it before, it is a Sandraism (basically something I made up). In the future when it becomes big you can say you heard it here first :-). So where did it come from , what does it mean and how can you use it to help you in your business? I was on my way to a client to discuss their content marketing strategy and I wanted to make it easy for them to plan and implement their content marketing plan so I had light bulb moment in the car (well I like to think it was a light bulb moment). I decided to take the process and break it into 4 key steps. It is about creating content in different forms for your customers to draw them into your website. It should not directly sell but showcase your expertise, passion and show them that you are the right person for the job. I am always asked ” why write blogs that clearly tell people how to optimise their websites?” My answer is simple. Out of all the people who read my articles, not many will want to do it themselves. They just want to find the right person for the job and writing good blog posts that show I have expertise in the area does just that. 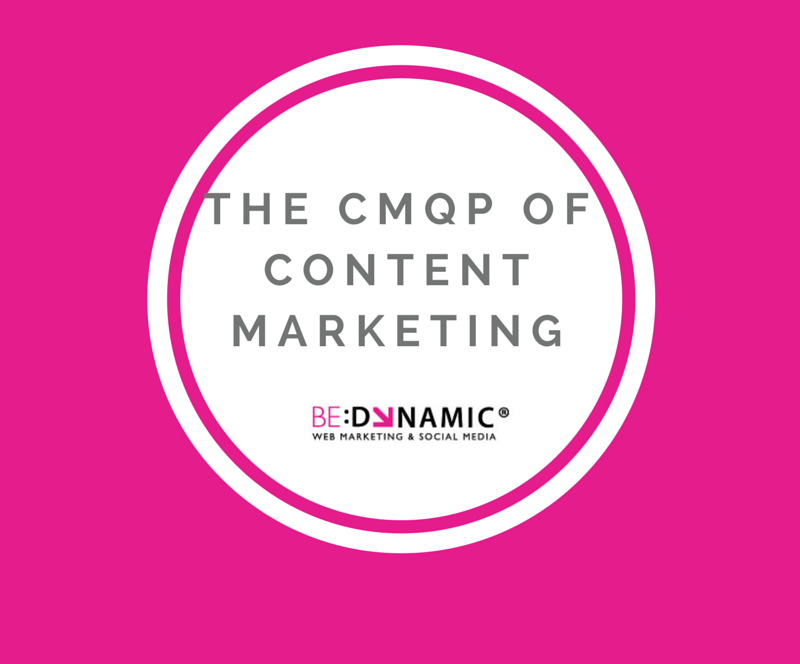 So now that you understand what content marketing is and how you can use it, lets get to the CMQP. 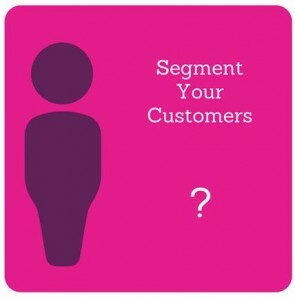 The first step in any good content marketing plan is understanding who your customers are and what they need from you. I have seen so many examples of bad content marketing down through the years. Businesses writing for the sake of writing because they were told it was good for SEO. Companies talking about topics that in no way relate to their products an services. They were advised to write about something that would bring in lots of traffic. Never mind the quality of the traffic, any traffic would do. This is crazy. When you are getting started into your content marketing plan think about who you are writing for. Break your customers into key segments. You may have already gone through this process. 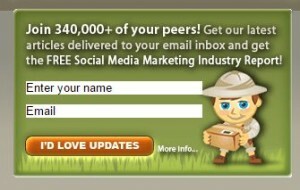 If not take time to create your customer profiles. This will help with all areas of marketing and will ensure that when you create great content you are creating it specifically for your customers. You need to know your customers before you can create content for them. Put a face and name to your customer profiles – it will help you to connect with them better and when you are writing you will be writing specifically for them. Images – you can tell a story using images . Infographics are very popular online right now. Audio – create an audio file. This is becoming quite popular as people are on the move and an audio file allows them to listen in while sitting in traffic or on their way home or even on their way to a meeting. No matter what you use, always remember that to make the content search engine friendly you need to include words. Search engines need the text elements to gauge what your content is about. Here are two great examples of great content using audio/video and text. Infographic example: Ian Cleary, Razorsocial created this content http://www.razorsocial.com/marketing-tools/ a good while ago but I always refer to it as a well written piece of content that is written for his customers but also has a visual impact. 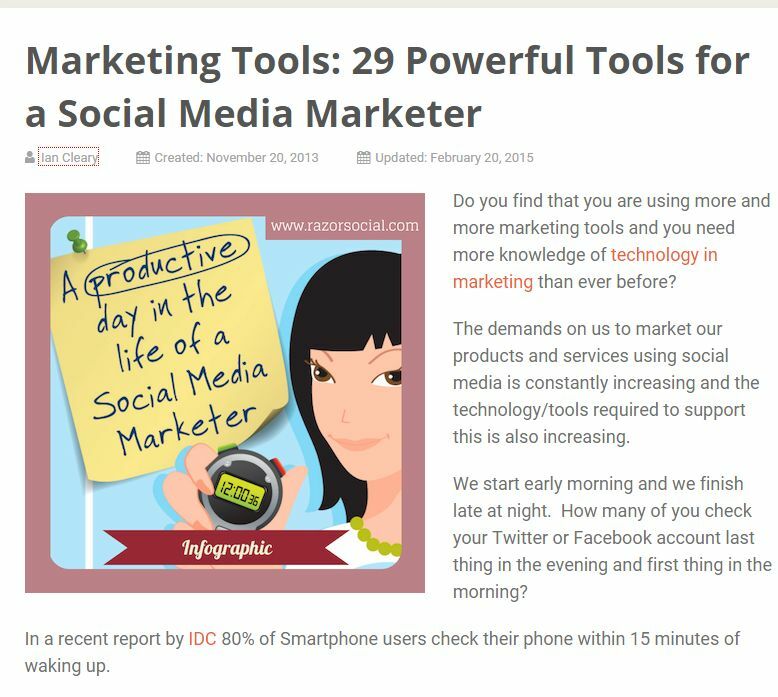 When you scroll down a little on the page you will see an infographic “A productive day in the life of a social media marketer”. The article is easily sharable to any social media platform. The images are good quality and the entry image includes the title. This makes it perfect for sharing on image based social platforms like Pinterest. Audio example: I am a big fan of Jon Loomer. If you are interested in Facebook advertising I highly recommend his site. This is one of Jon’s latest posts http://www.jonloomer.com/2015/02/09/facebook-ad-targeting/. On entry you are given a audio option to listen to blog post or you can read the copy that is included. Great for his customers and great for search engines also. So now that you know what medium and media you will use its time to think about what you will write about. I find the most successful content is when you answer a question. Provide content that solves a problem. It may be a problem customers may not realise they have yet or it can be the answer to questions you asked get every day. Think of all the questions you get asked about your product, service or industry. Can you create valuable content answering these problems? The answer is yes. Do you engage with customers regularly or are there other people in the business that can help with this? I love getting a few people into a room and brainstorming ideas. Create a list of questions that you often get asked. This can be the starter point. Now we get to the planning stage. Planning is important but there is no point in planning if you are not going to implement, track and analyse. This stage allows you time to create a plan of action. I usually create a spreadsheet where I fill in the following headings for each piece of content that will be created. Day / Week / Month: the day, week or month that the content is needed for (there will be a specific publish date also – see below). It is important that you give yourself time to create the content and have it proofread and edited. Never proof read your own content. SEO target keywords/ search terms – what will you be optimising the content for? What keywords or search terms do you want this piece of content to be found for in search engines? Objective – What is the objective of this piece of content? Why are you creating this content? What are you trying to achieve with this content? Who: Who is responsible for creating the content? Social Media Sharing: What social platforms will you share it on and when? 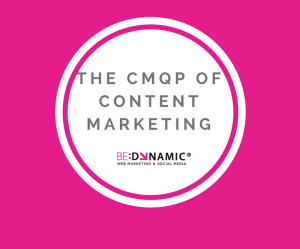 So there you have it, the CMQP of content marketing. I hope you found it useful. I would love your feedback. How do you plan your content marketing?